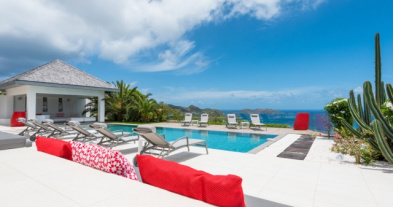 This newly built Villa LEGENDS B property is one of the most spectacular and top villa available for rent in St-barths. This is the perfect choice for discerning travellers who are looking for a luxury gateaway, with complete privacy, and exclusive amenities. Situated high on a hillside located in the secluded area of Lurin, Villa LEGENDS B, is a magnificent and exceptional five bedroom property, offering utterly breathtaking and panoramic ocean view facing the sunset. 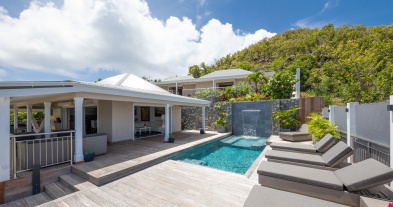 This ultra-contemporary Villa LENGENDS B and the newly built estate is one of the most luxurious retreats available for rent, within minutes from the beautiful beaches of Gouverneur and Saline, as well as restaurants and shopping in Gustavia. Set on multiple levels with dramatic architecture from the entryway, the Villa LEGENDS B features ultra-deluxe decor, especially inspired by Haute couture designers, with state of the art modern types of equipment and sophistication. On the top level is the covered parking area which can allow five cars. Few stairs below, you find the spacious first master bedroom. This bedroom, which has floors made from the wood of an original Orient Express train wagon, and also features a French king-size bed, a large ensuite bathroom, and private sundeck. The villa's main structure features an open floor plan with a spacious and fully air-conditioned great room, which includes a large gourmet kitchen bordered by a long countertop breakfast bar with stools. On the other side is the living area, with a 50-inch flat-screen satellite TV, and large and comfortable sectional sofas facing the view. Villa LEGENDS B brings the idea of seamless indoor/outdoor living to a crescendo. Outside, underneath the covered terrace, is a design and white dining table that can seats ten guests. The long, heated pool is on this level, as are three of the five bedrooms, all positioned in front of the pool, with direct access to the terrace. You have also a fully equipped fitness room where you can practice your routine exercises. The very expansive deck sets also an outdoor living area with cozy seatings and loungers, perfect for enjoying the mesmerizing sunsets. Villa LEGENDS B's lowest level is the second master bedroom, which offers a private terrace with Jacuzzi and astonishing views. Each immaculate bedroom has a European king-size bed, a designer dressing area, an ensuite bathroom with shower and U.S. satellite services. 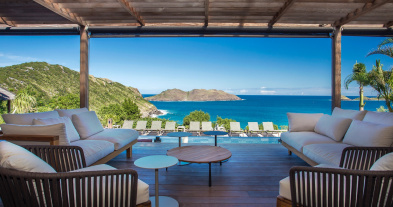 This property is probably one of the most incredible and top villa in St-barths, and it is the perfect choice for discerning travelers who are looking for unique amenities, complete privacy, and an exclusive getaway. Euro King Bed, A/C, Ceiling Fan, HDTV, Dish Network,Apple TV, iPod Connection, Key Safe, Walk-in Closet, Ensuite bathroom with rain Head Shower, Hair Dryer, Private terrace and jacuzzi , Private Access to Room. Euro King Bed, A/C, Ceiling Fan, HDTV, Dish Network,Apple TV, iPod Connection, Key Safe, Walk-in Closet, Ensuite bathroom with rain Head Shower, Hair Dryer, Direct access to the terrace and pool. Euro King Bed, A/C, Ceiling Fan, HDTV, Dish Network,Apple TV, iPod Connection, Key Safe, Walk-in Closet, Ensuite bathroom with rain Head Shower, Hair Dryer,Direct access to the terrace and pool. Tropical and lush garden, dramatic ocean views and beautiful sunset from every parts of the property.